Babua Island is a small uninhabited island with tremendous view of marine and underwater site. This island is near to Jailolo harbor, it only takes 10-15 minutes by using wooden boat. 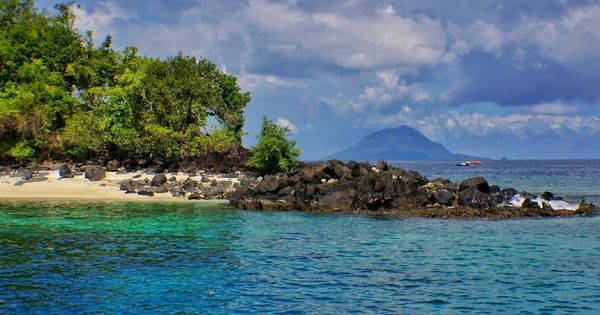 The view around Babua Island is about Halmahera Island, especially Jailolo, Ternate and Tidore. There are few of small beaches with white sandy beach that still worth visiting. If we crave to dive and to snorkel, this island is perfect for doing that. There are two diving spots that can be choosen. NHR 1. NHR is stands for foremer regent in west Halmahera, Hamto Hui Roba that found one spot diving in Jailolo. This diving site is considering easy; starts from the wall, slope and return to the wall again the dept is about 15 – 25 meters. This diving spot is popular by as Jojo Reef. The divers that diving to this spot have to go round the coral reef in the depth of 5 meter until 20 meter, including the side wall of Jailolo ocean. The condition of the sea water is not always clear and the visibility is about 15 – 20 meter. Yet, even in the muddy water, the beauty is still enchanting.